ISLAMABAD — U.S. peace envoy Zalmay Khalilzad arrived in Pakistan on Thursday, the last leg of a regional tour aimed at finding a negotiated conclusion to Afghanistan’s 17-year war, which would end the U.S.'s longest military engagement. He is reportedly in Pakistan to seek Islamabad’s help in getting the Taliban leadership into direct talks with President Ashraf Ghani’s representatives. Pakistan says its influence over the Taliban is overstated, yet the arrest earlier this week in Pakistan’s border city of Peshawar of Taliban leader Hafiz Mohibullah, ahead of Khalilzad’s visit, has been seen as a likely attempt to pressure the insurgent group into talks. Mohibullah is a member of the Taliban's political commission in Pakistan and a former Taliban military commander overseeing operations in 18 Afghan provinces, mostly in the east and north of the country. The Taliban issued a statement Tuesday threatening to end contact with the U.S. even as Washington’s peace envoy makes another round of the region in pursuit of a negotiated end to Afghanistan’s protracted conflict before a frustrated President Donald Trump makes good on his 2016 campaign promise to end America’s involvement. The Taliban have been steadfast in their refusal to talk to the government, even issuing a statement earlier this week threatening to halt talks with the United States. 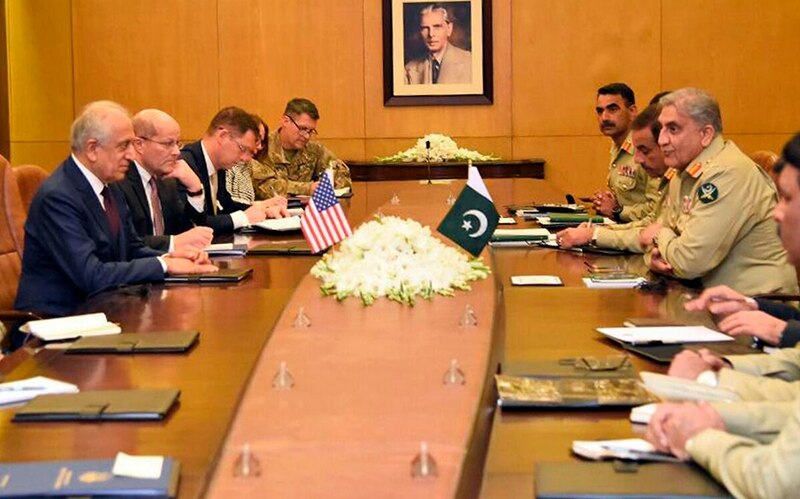 They say Washington has sought to expand the scope of talks beyond the withdrawal of U.S. and NATO troops from Afghanistan and ways of ensuring Afghanistan is not again used as a staging arena to attack another, as al-Qaida did on 9/11. The Taliban statement did not specify what else the U.S. had sought, but Afghanistan's new peace envoy Mohammad Omar Daudzai has told The Associated Press that Khalilzad expected the Taliban to meet Ghani's representatives in November in the United Arab Emirates. According to Daudzai, Khalilzad had received guarantees from Saudi Arabia that the Taliban would enter into direct talks. They refused, which reportedly infuriated Afghanistan's president Ghani who had sent his National Security Adviser Hamdullah Mohib to the UAE. Since taking on the job of peace envoy, Khalilzad has met on several occasions with Taliban officials in their political office in Qatar but the Taliban leaders in Pakistan are considered influential. Earlier on Thursday, Ghani called Pakistan's Prime Minister Imran Khan, and while details were sketchy, a press statement from Khan's office said the discussion centered on finding a peaceful end to the protracted war in Afghanistan. "Prime Minister Imran Khan assured President Ghani that Pakistan was making sincere efforts for a negotiated settlement of the conflict in Afghanistan through an inclusive peace process, as part of shared responsibility," according to the statement. Pakistan has repeatedly said its influence over the Taliban is exaggerated. Still, Khan __ even before his election last year __ had called for negotiations to end the war. Reports that the U.S. is planning to begin withdrawing its troops in the summer and U.S. President Donald Trump's statements that he has grown weary of the Afghan war has lent a sense of urgency to each new round of talks spearheaded by Khalilzad. Trump has expressed his frustration with the progress of the war, even chastising his generals, telling his Cabinet earlier this month that "they didn't do such a good job in Afghanistan." After 17 years and nearly $1 trillion in U.S. spending, Washington’s own watchdog says the Taliban control or hold sway in nearly 50 percent of the country. Other estimates put it even higher. Punishing near daily attacks by insurgents on Afghanistan’s National Security and Defense forces has taken a heavy toll on manpower and morale.